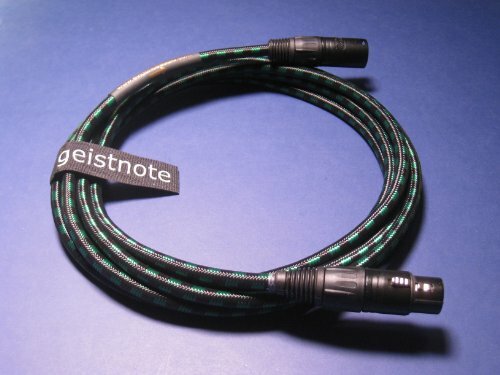 Geistnote added Neutrik Gold Connectors to Evidence Audio's Lyric HG as an alternative to the Nickel/Nickel Connectors found on the normal Lyric HG microphone cable. Evidence Audio ranks the Lyric HG Microphone Cable among the best cable they offer. The combination of high-grade IGL copper conductors and solid core primary conductors means the Lyric HG offers up smooth midrange and highs with clarity and focus that reveal the harmonic detail and articulation. The mic cable's 20 AWG conductor size is large enough to communicate punch and authority, yet small enough to preserve a sense of air and delicacy. The symmetrical design of the Lyric HG cable allows dynamics to scream from the quietest of backgrounds without using the shield to carry your signal. Other design benefits include conductive skins applied to the positive and negative runs for reduced microphonics with high gain amps, high-density copper braid shield to ensure a clean signal to your amp, and woven nylon jacket for increased flexibility and protection during stage use.